I’ve finally found a way to use all the gelli prints I made last year! At first I thought that this 50 Book Project would be a great way to use up my embarrassingly large stash of commercial and handmade papers, but it turns out I really like using my own gelatin prints. When I make the book covers using my own prints they’re completely unique because no print ever turns out the same but also because they use the colors and textures that are unique to me. 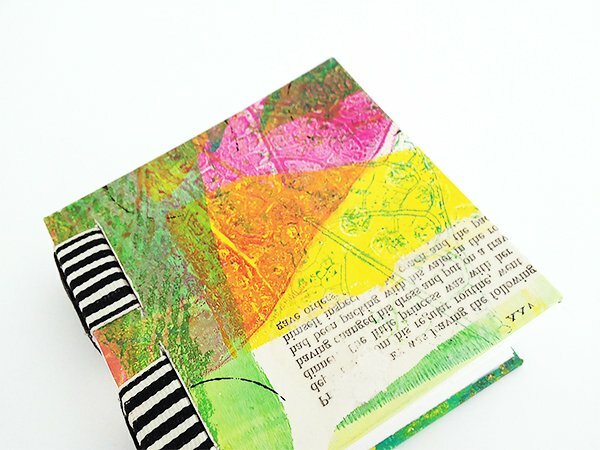 I feel like the gelli print books reflect my own style a lot better – there’s more of ‘me’ in each one. Enough waffling – here’s book number 7 in the 50 Book Project. It’s a simple sewn onto tapes, or in this case two pieces of 1″ wide ribbon (it’s some retired Stampin’ Up! ribbon that I had left over). It’s different from last week’s book because there are no kettle stitches at the head and tail. 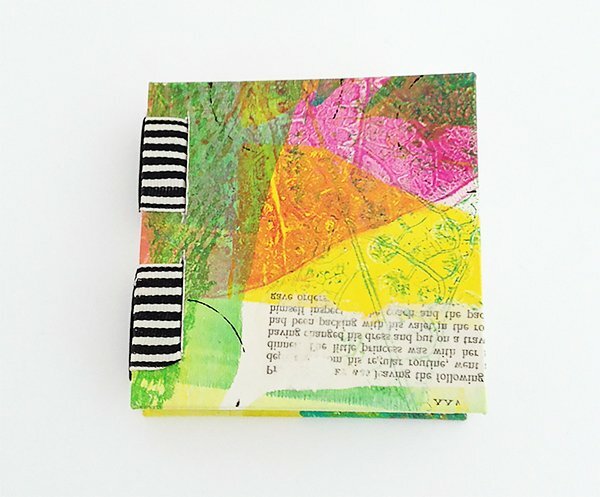 It’s a small book measuring 4″ x 4″ so I think that counts as a mini book. 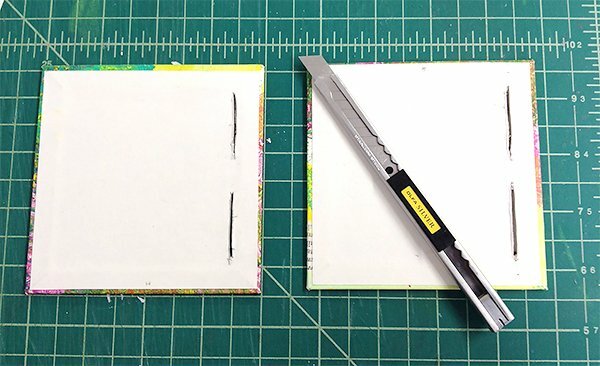 I covered 2 pieces of book board with a gelli print and then cut 2 slits the width of the ribbon on each one. Once I’d sewn together the book block over the ribbons, I slotted the ribbons through the slits and glued them down with PVA. 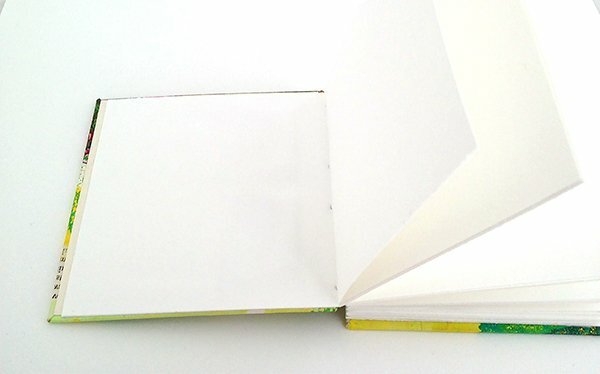 I glued the first and last pages of the book to the inside cover to hide the ribbon and make the whole book more secure. Here’s a closer look at the stitching on the spine of the book. 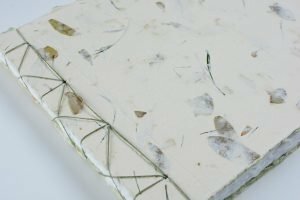 The reversed text you can see on the book cover was a quick gel transfer of an old book page directly onto the gelli print. Thanks for visiting today. If you don’t want to miss the next 40+books, please sign up for my weekly newsletter here. 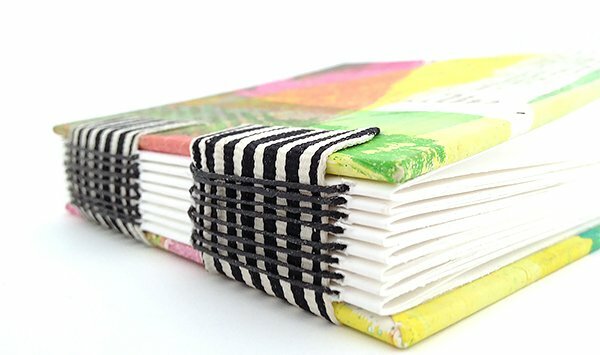 Love this binding! How large a book would this support? Hi Vicki – this one is small at 4″ x 4″ and the two pieces of ribbon are oversized. 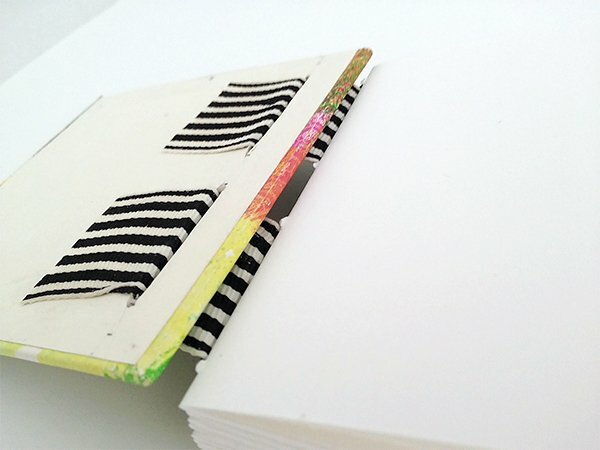 If the book is larger, you can add more tapes/ribbons to support the covers. The one below is 6″ high and has 3 tapes, which are 1/2″ wide.